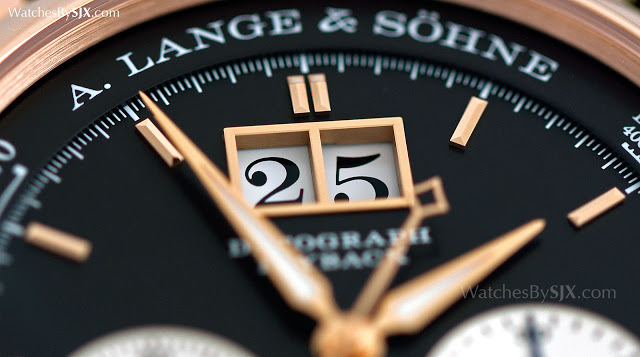 Unveiled just earlier this year, the pink gold Lange Datograph Up/Down offers a striking contrast with its black dial, along with the exemplary L951 movement. 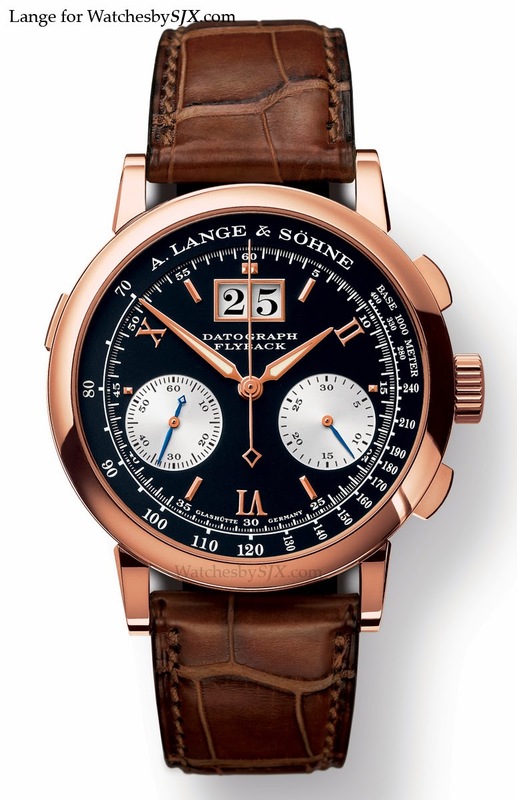 As chronographs go, the Datograph from A. Lange & Söhne is one of the greats. 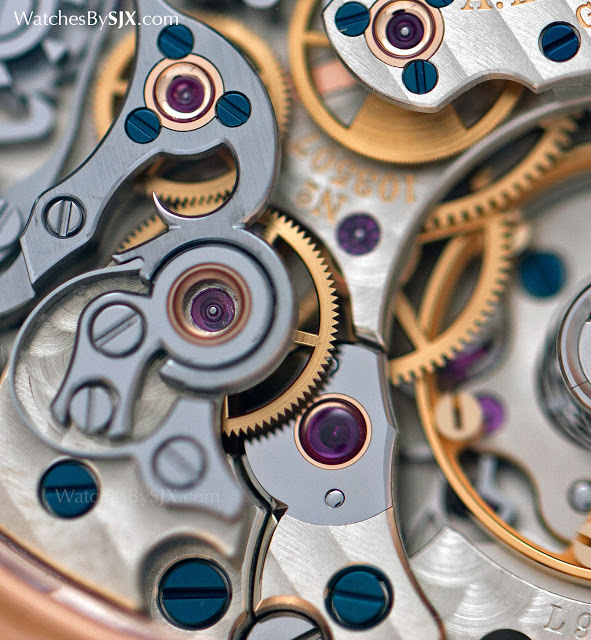 Not because it’s innovative or cutting edge, but because the movement is gorgeous. 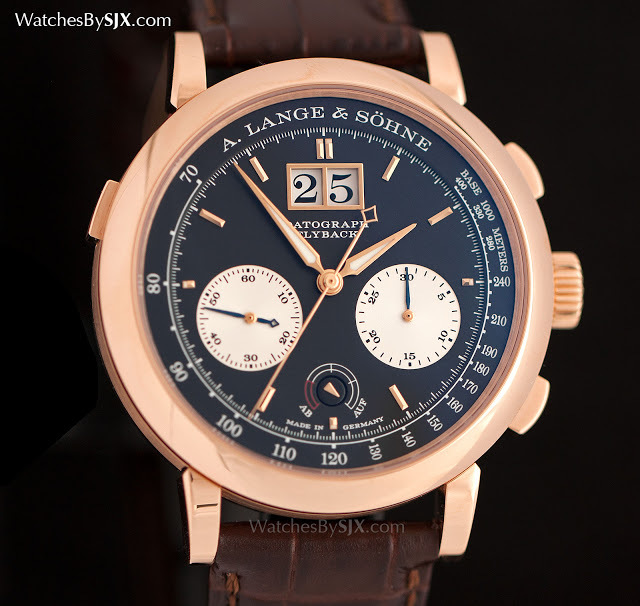 First introduced in platinum, the Lange Datograph Up/Down was introduced in pink gold at SIHH 2015. Aside from the case metal, everything else remains the same. 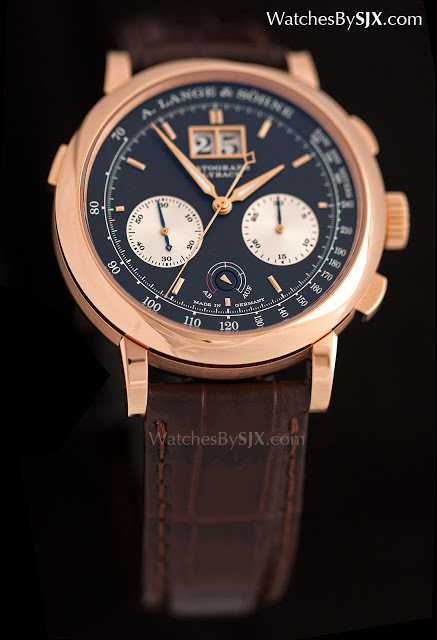 The pink gold and black dial version of the first generation Datograph has been nicknamed the “Dufour Datograph”, because independent watchmaker Philippe Dufour famously bought one, often noting it’s the only watch he ever bought, instead of made. The new Up/Down has the same look, but slightly more modern in appearance with its cleaner dial. 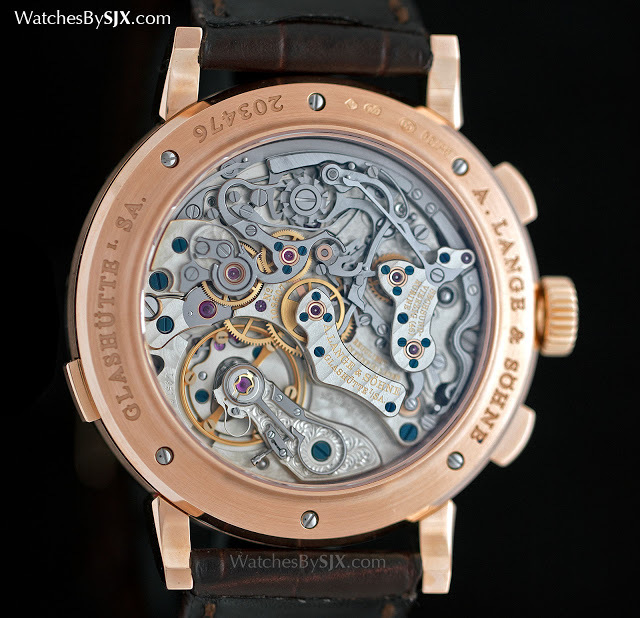 With a case diameter of 41mm, the Up/Down is slightly larger than the 39mm first generation model. All the elements of the dial have been enlarged to fit the case, so the dial retains the same pleasing proportions as on the original. It’s also been simplified, with baton indices instead of a combination of baton markers and Roman numbers. And it has a power reserve indicator at six o’clock, hence the “Up/Down” appellation. The new look, standard for the whole Saxonia range, is uncluttered, but has arguably less character than the original. Ab and auf translate as “down” and “up”. Now known as the calibre L951.6 (the original was the L951.1), the movement has been upgraded significantly for the Up/Down. It boasts a useful 60 hour power reserve, compared to just 36 in the original. 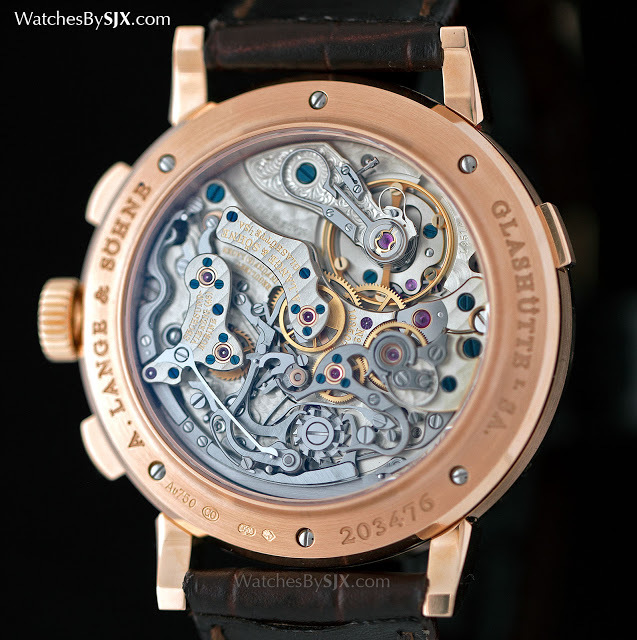 And it uses Lange’s in-house, free sprung balance wheel along with the in-house overcoil hairspring, instead of the screwed Glucydur balance in the original. Technical improvements aside, the movement still looks as stunning as it did in the first generation. It’s multi-layered and wonderfully detailed. 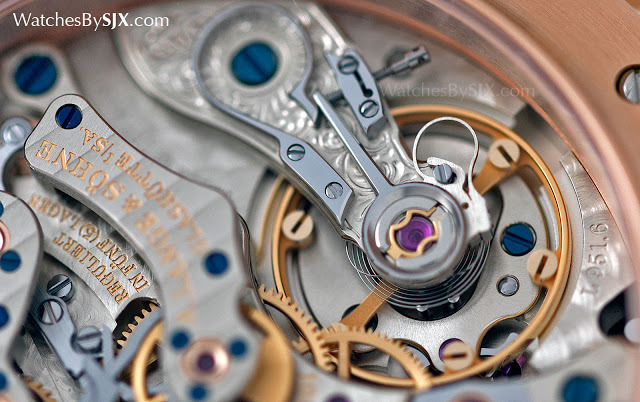 While the movement is slightly less sophisticated in terms of construction as compared to the Patek Philippe CH 29, it wins hands down for visual appeal. 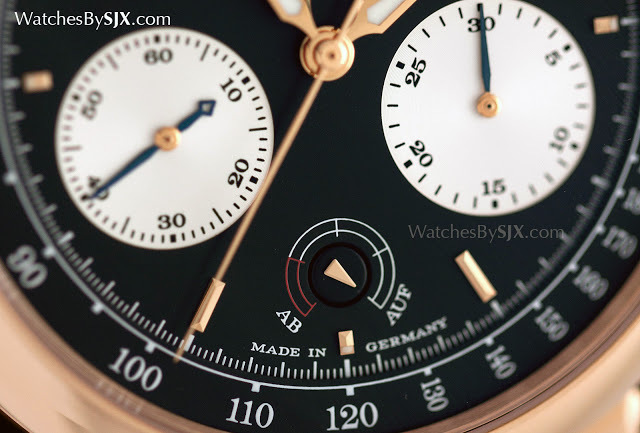 The Datograph Up/Down in pink gold retails for €66,000, including value added tax of 19%.